Music is a language everybody understands. At least so I thought, until I learned that the note I had known as H back home in Germany was called B in English. B also exists in German, but it’s what the English-speaking world calls B flat. By the way, in Dutch that same note is known as Bes, whereas in France they call it Si bémol. What a cacophonous clash of terminology! And Japanese? Well, the scale that children normally first learn in elementary school is the Italian-based do-re-mi system. It goes as follows (Italian in parentheses after the Japanese where it differs): ド (do), レ (re), ミ (mi), ファ (fa), ソ (so, sol) ラ (ra, la) and シ (shi, si). Singing along in this mode is assisted by the tremendously popular song from “The Sound of Music,” though the Japanese version is a bit different from the original: “Do” is not for “doe” but for ドーナツ (dōnatsu, donut), “re” not “ray” but レモン (remon, lemon), “mi” not “me” but みんな (minna, everyone), “fa” not “far” but ファイト (faito, “Do your best!”), and so on. From a more technical point of view, some music educators complain (see hdl.handle.net/10236/10303) that the do-re-mi system as it is being taught in Japan today is increasingly based on absolute rather than relative pitch notation. That means that a do, for instance, will always be the white C key to the left of the two black keys on a piano or a ピアニカ (pianika, melodica), no matter if it’s the tonic of the current scale or not. 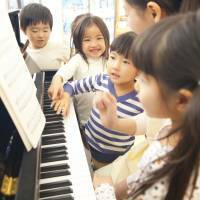 Linguistically speaking that doesn’t make much difference, but musically it does, because learning do-re-mi as a system of relative pitch — also called solfege — is much more useful when it comes to sight-reading and singing. A second important language of music in Japan is German. Particularly in the domain of classical music, the do-re-mi system is normally replaced by the German terminology. Consequently, we get the following note names: ツェー (tsē, C), デー (dē, D), エー (ē, E), エフ (efu¸ F), ゲー (gē, G), アー (ā, A), and ハー (hā), which is the aforementioned English B. For classical music professionals, these names are so second-nature that they often use them even for quite different purposes. For instance, when someone says that the ticket will cost ツェー万ゲー千円 (tsē-man gē-sen en), that means you’ll have to pay C times ¥10,000 and G times ¥1,000. With C being the first note in the (C) scale, and G the fifth, the price of the ticket is ¥15,000. In more contemporary genres of music such as jazz and pop, the English way of reading notes is the main currency. That gives us a third set of names, as follows: シー (shii, C), ディー (dii, D), イー (ii, E), エフ (efu, F), ジー (jii, G), エー (ē, A), and ビー (bii, B). Sometimes this may be a bit confusing, not only as to the old B vs. H problem, but also because out of context, it is hard to know if エー (ē) is supposed to refer to English A or German E. However, since music does not normally occur “out of context,” musicians cope with this quite well. Apart from the three foreign-based terminologies, Japan also has its own, domestic way of naming the notes. It is derived from the C-D-E system, but replaces the letters with the corresponding kana items from the i-ro-ha syllabary, whose order is dictated by a Heian Period (794-1185) poem that uses each syllable just once. Since C is the third letter of the alphabet, we start with i-ro-ha‘s syllable No. 3. This gives us the following scale: ハ (ha, C), 二 (ni¸ D), ホ (ho, E), ヘ (he, F),ト (to, G), イ (i, A), and ロ (ro, B). 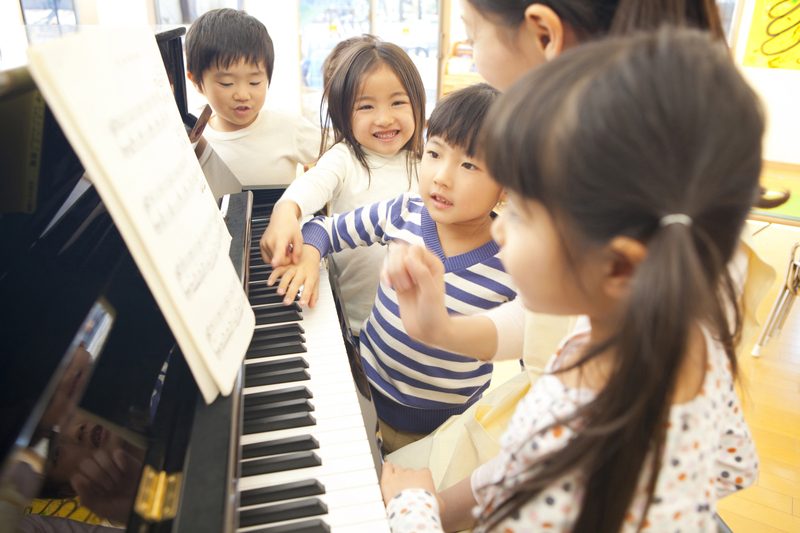 Although classical music is dominated by the German system, the key of a classical piece of music is commonly given based on the Japanese terminology. For major and minor, the terms 長調 (chōchō) and 短調 (tanchō) are attached. On the radio, that gives us announcements like ベートーベン作曲交響曲第六番ヘ長調「田園」 (Bētōben Sakkyoku Kōkyōkyoku Dai Roku Ban He Chōchō, “Den-en”), for Beethoven’s “Pastoral” Symphony No. 6 in F Major. To the average lay listener, it’s easier to explain Beethoven’s Ninth, which is known simply as 第九 (Dai Ku, No. 9), though they won’t call it that on the radio. From a linguistic viewpoint, it is interesting how the concurring systems deal with semitones. Take C#, for instance, which in the world of jazz and pop would be シー シャープ (shii shāpu, C sharp). In classical music it would be referred to as ツィス (tsisu), based on the German expression “Cis.” The Japanese system uses the prefix 嬰 (ei) to express the #, so Beethoven’s Moonlight Sonata in C# Minor has the Japanese key 嬰ハ短調 (ei ha tanchō). But what do you we do with the do-re-mi system? C# in Italian is called do diesis (and “di” in solfege), but that’s not how things are dealt with in Japan. Instead, the Italian reading is crossbred with English, resulting in a very multilingual ドのシャープ (do no shāpu, the sharp of “do”).